These highlights do not include all the information needed to use BEXSERO safely and effectively. See full prescribing information for BEXSERO. To report SUSPECTED ADVERSE REACTIONS, contact GlaxoSmithKline at 1-888-825-5249 or VAERS at 1-800-822-7967 or http://www.vaers.hhs.gov. Administer 2 doses (0.5-mL each) of BEXSERO at least 1 month apart. Shake the syringe immediately before use to form a homogeneous suspension. Do not use the vaccine if it cannot be resuspended. Parenteral drug products should be inspected visually for particulate matter and discoloration prior to administration, whenever solution and container permit. Do not use if particulate matter or discoloration is found. Administer BEXSERO as a 0.5-mL intramuscular injection into the deltoid muscle of the upper arm. Sufficient data are not available on the safety and effectiveness of using BEXSERO and other meningococcal group B vaccines interchangeably to complete the vaccination series. BEXSERO is a suspension for intramuscular injection in 0.5-mL single-dose prefilled syringes. Hypersensitivity, including severe allergic reaction, to any component of the vaccine, or after a previous dose of BEXSERO [see Description (11)]. Appropriate observation and medical treatment should always be readily available in case of an anaphylactic event following the administration of the vaccine. Syncope (fainting) can occur in association with administration of BEXSERO. Ensure procedures are in place to avoid injury from falling associated with syncope. The tip caps of the prefilled syringes contain natural rubber latex which may cause allergic reactions in latex-sensitive individuals. BEXSERO may not protect all vaccine recipients. BEXSERO may not provide protection against all meningococcal serogroup B strains [see Clinical Pharmacology (12.1)]. Some individuals with altered immunocompetence may have reduced immune responses to BEXSERO. The most common solicited adverse reactions observed in clinical trials were pain at the injection site (≥83%), myalgia (≥48%), erythema (≥45%), fatigue (≥35%), headache (≥33%), induration (≥28%), nausea (≥18%), and arthralgia (≥13%). Because clinical trials are conducted under widely varying conditions, adverse reaction rates observed in clinical trials of a vaccine cannot be directly compared with rates in the clinical trials of another vaccine and may not reflect the rates observed in practice. In 4 clinical trials, 3,058 individuals aged 10 through 25 years received at least one dose of BEXSERO, 1,436 participants received only BEXSERO, 2,089 received only placebo or a control vaccine, and 1,622 participants received a mixed regimen (placebo or control vaccine and BEXSERO). In a randomized controlled study1 conducted in U.S. and Poland, 120 participants aged 10 through 25 years received at least 1 dose of BEXSERO, including 112 participants who received 2 doses of BEXSERO 2 months apart; 97 participants received saline placebo followed by MENVEO [Meningococcal (Groups A, C, Y, and W-135) Oligosaccharide Diphtheria CRM197 Conjugate Vaccine]. Across groups, median age was 13 years, males comprised 49%, and 60% were white; 34% were Hispanic, 4% were black, <1% were Asian, and 2% were other. In a second randomized controlled study2 conducted in Chile, all subjects (N = 1,622) aged 11 through 17 years received at least 1 dose of BEXSERO. This study included a subset of 810 subjects who received 2 doses of BEXSERO 1 or 2 months apart. A control group of 128 subjects received at least 1 dose of placebo containing aluminum hydroxide. A subgroup of 128 subjects received 2 doses of BEXSERO 6 months apart. In this study, median age was 14 years, males comprised 44%, and 99% were Hispanic. In a third randomized controlled study3 conducted in the United Kingdom (U.K.), 974 university students aged 18 through 24 years received at least 1 dose of BEXSERO, including 932 subjects who received 2 doses of BEXSERO 1 month apart. Comparator groups received 1 dose of MENVEO followed by 1 dose of placebo containing aluminum hydroxide (n = 956) or 2 doses of IXIARO (Japanese Encephalitis Vaccine, Inactivated, Adsorbed) (n = 947). Across groups, median age was 20 years, males comprised 46%, and 88% were white, 5% were Asian, 2% were black, <1% were Hispanic, and 4% were other. In an uncontrolled study4 conducted in Canada and Australia, 342 participants aged 11 through 17 years received at least 1 dose of BEXSERO, including 338 participants who received 2 doses of BEXSERO 1 month apart. The median age was 13 years, males comprised 55%, and 80% were white, 10% were Asian, 4% were Native American/Alaskan, and 4% were other. Local and systemic reactogenicity data were solicited from all participants in the studies conducted in Chile, U.S./Poland, Canada/Australia, and in a subset of participants in the U.K. study. Reports of unsolicited adverse events occurring within the first 7 days after each vaccination were collected in all studies. In the U.S./Poland study, reports of unsolicited adverse events were collected up to 1 month after the second vaccination. Reports of all serious adverse events, medically attended adverse events, and adverse events leading to premature withdrawal were collected throughout the study period for the studies conducted in Chile (12 months), U.K. (12 months), U.S./Poland (8 months), and Canada/Australia (2 months). The reported rates of local and systemic reactions among participants aged 10 through 25 years following each dose of BEXSERO administered 2 months apart or control in the U.S./Polish study1 are presented in Table 1 and Table 2.
a Erythema and induration: Any (≥1 mm). Pain: Mild (transient with no limitation in normal daily activity); Moderate (some limitation in normal daily activity); Severe (unable to perform normal daily activity). b Administered 2 months after Dose 1.
a Systemic reactions: Mild (transient with no limitation in normal daily activity); Moderate (some limitation in normal daily activity); Severe (unable to perform normal daily activity). In the 3 controlled studies1,2,3 (BEXSERO n = 2,221, control n = 2,204), non-serious unsolicited adverse events that occurred within 7 days of any dose were reported by 439 (20%) participants receiving BEXSERO and 197 (9%) control recipients. Unsolicited adverse events that were reported among at least 2% of participants and were more frequently reported in participants receiving BEXSERO than in control recipients were injection site pain, headache, injection site induration unresolved within 7 days, and nasopharyngitis. Overall, in clinical studies, among 3,058 participants aged 10 through 25 years who received at least 1 dose of BEXSERO, 66 (2.1%) participants reported serious adverse events at any time during the study. In the 3 controlled studies1,2,3 (BEXSERO n = 2,716, control n = 2,078), serious adverse events within 30 days after any dose were reported in 23 (0.8%) participants receiving BEXSERO and 10 (0.5%) control recipients. 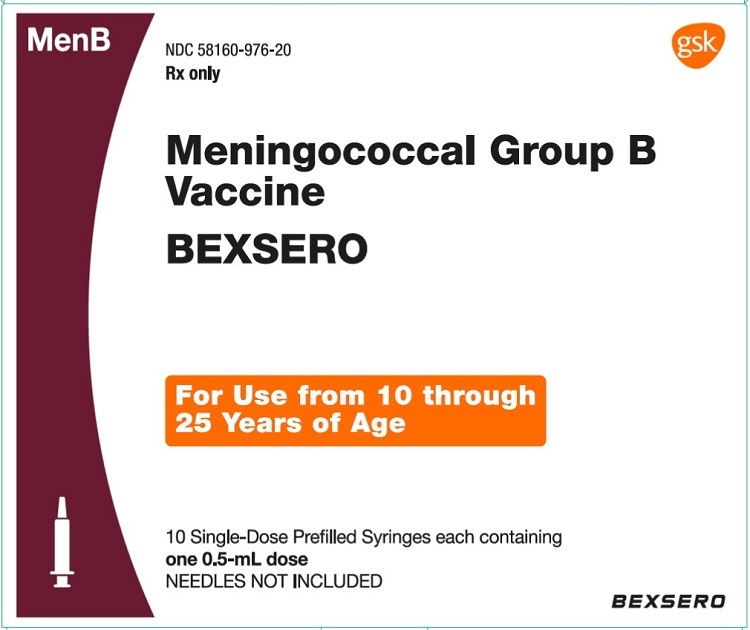 In response to outbreaks of serogroup B meningococcal disease at 2 universities in the U.S., BEXSERO was administered as a 2-dose series at least 1 month apart. Information on serious adverse events was collected for a period of 30 days after each dose from 15,351 individuals aged 16 through 65 years who received at least 1 dose. Overall 50 individuals (0.3%) reported serious adverse events, including one event considered related to vaccination, a case of anaphylaxis within 30 minutes following vaccination. Adverse event reports received for BEXSERO marketed outside the U.S. are listed below. Because these events are reported voluntarily from a population of uncertain size, it is not always possible to estimate reliably their frequency, or to establish a causal relationship to vaccination. This list includes serious events or events which have suspected causal association to BEXSERO. Injection site reactions (including extensive swelling of the vaccinated limb, blisters at or around the injection site, and injection site nodule which may persist for more than 1 month). Allergic reactions (including anaphylactic reactions), rash, eye swelling. Syncope, vasovagal responses to injection. Sufficient data are not available to establish the safety and immunogenicity of concomitant administration of BEXSERO with recommended adolescent vaccines. Reproduction studies have been performed in rabbits at doses up to 15 times the human dose on a body-weight basis and have revealed no evidence of impaired fertility in females or harm to the fetus due to BEXSERO. There are, however, no adequate and well-controlled studies in pregnant women. Because animal reproduction studies are not always predictive of human response, BEXSERO should be used during pregnancy only if clearly needed. GlaxoSmithKline maintains a surveillance registry to collect data on pregnancy outcomes and newborn health status outcomes following exposure to BEXSERO during pregnancy. Women who receive BEXSERO during pregnancy should be encouraged to contact GlaxoSmithKline directly or their healthcare provider should contact GlaxoSmithKline by calling 1-877-413-4759. It is not known whether BEXSERO is excreted in human milk. Because many drugs are excreted in human milk, caution should be exercised when BEXSERO is administered to a nursing woman. Safety and effectiveness of BEXSERO have not been established in children younger than 10 years. Safety and effectiveness of BEXSERO have not been established in adults older than 65 years. 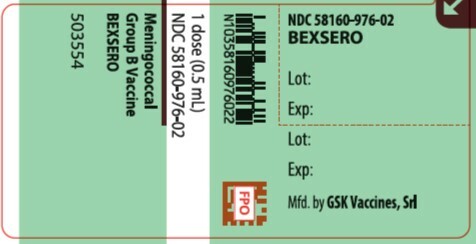 BEXSERO (Meningococcal Group B Vaccine) is a sterile, white, opalescent, suspension for intramuscular injection. Each 0.5-mL dose of BEXSERO is formulated to contain 50 micrograms each of recombinant proteins Neisserial adhesin A (NadA), Neisserial Heparin Binding Antigen (NHBA), and factor H binding protein (fHbp), 25 micrograms of Outer Membrane Vesicles (OMV), 1.5 mg aluminum hydroxide (0.519 mg of Al3+), 3.125 mg sodium chloride, 0.776 mg histidine, and 10 mg sucrose at pH 6.4 – 6.7. The NadA component is a fragment of the full-length protein derived from N. meningitidis strain 2996 (peptide 8 variant 2/3)5. The NHBA component is a recombinant fusion protein comprised of NHBA (peptide 2)5 and accessory protein 953 derived from N. meningitidis strains NZ98/254 and 2996, respectively. The fHbp component is a recombinant fusion protein comprised of fHbp (variant 1.1)5 and the accessory protein 936 derived from N. meningitidis strains MC58 and 2996, respectively. These 3 recombinant proteins are individually produced in Escherichia coli and purified through a series of column chromatography steps. The OMV antigenic component is produced by fermentation of N. meningitidis strain NZ98/254 (expressing outer membrane protein PorA serosubtype P1.4)6, followed by inactivation of the bacteria by deoxycholate, which also mediates vesicle formation. The antigens are adsorbed onto aluminum hydroxide. Each dose contains less than 0.01 micrograms kanamycin (by calculation). Protection against invasive meningococcal disease is conferred mainly by complement-mediated antibody-dependent killing of N. meningitidis. The effectiveness of BEXSERO was assessed by measuring serum bactericidal activity using human complement (hSBA). NHBA, NadA, fHbp, and PorA are proteins found on the surface of meningococci and contribute to the ability of the bacterium to cause disease. Vaccination with BEXSERO leads to the production of antibodies directed against NHBA, NadA, fHbp, and PorA P1.4 (present in OMV). The susceptibility of serogroup B meningococci to complement-mediated antibody-dependent killing following vaccination with BEXSERO is dependent on both the antigenic similarity of the bacterial and vaccine antigens, as well as the amount of antigen expressed on the surface of the invading meningococci. BEXSERO has not been evaluated for carcinogenic or mutagenic potential or impairment of male fertility. The immunogenicity of BEXSERO following 2 doses was evaluated in individuals aged 11 through 24 years. Serum bactericidal antibodies were measured with hSBA assays using 3 strains selected to measure responses to one of 3 vaccine antigens, either fHbp, NadA, or PorA P1.4, prevalent among strains in the U.S. A suitable strain for assessing bactericidal activity of NHBA-specific antibodies was not available. Studies assessed the proportion of subjects who achieved a 4-fold or greater increase in hSBA titer for each of the 3 strains, and the proportion of subjects with a titer greater than or equal to the lower limit of quantitation (LLOQ) of the assay for all 3 strains (composite response). The LLOQ was defined as the lowest amount of the antibody in a sample that can be reliably quantified. Available data showed that baseline antibody titers across populations vary. In a clinical trial conducted in Canada and Australia, adolescents aged 11 through 17 years received 2 doses of BEXSERO 1 month apart. The hSBA responses 1 month after the second dose are shown in Table 3 and Table 4. Abbreviations: CI = Confidence interval; hSBA = Serum bactericidal activity measured using human complement; LLOQ = Lower limit of quantitation. a Evaluable Immunogenicity Population (aged 11 through 17 years). b ≥4-fold hSBA response is defined as: a post-vaccination hSBA ≥1:16 for participants with pre-vaccination hSBA <1:4, a post-vaccination titer at least 4-fold the LLOQ for participants with pre-vaccination hSBA ≥1:4 but < LLOQ, and a post-vaccination 4-fold rise for participants with pre-vaccination hSBA ≥LLOQ. c LLOQ = 1:16 for H44/76; 1:16 for 5/99; 1:8 for NZ98/254. b LLOQ = 1:16 for H44/76; 1:16 for 5/99; 1:8 for NZ98/254. c Composite hSBA Response means hSBA ≥LLOQ for all 3 indicator Meningococcal B strains. In a randomized, controlled clinical trial conducted in the U.K. among university students aged 18 through 24 years, hSBA responses in a subset of participants who received BEXSERO were measured 1 month and 11 months after the second dose (Table 5 and Table 6). a Evaluable Immunogenicity Population (aged 18 through 24 years). b ≥4-fold hSBA response is defined as: a post-vaccination hSBA ≥1:16 for participants with pre-vaccination hSBA <1:4, a post-vaccination titer at least 4-fold the LLOQ for participants with pre-vaccination hSBA ≥1:4 but <LLOQ, and a post-vaccination 4-fold rise for participants with pre-vaccination hSBA ≥LLOQ. c LLOQ = 1:16 for H44/76; 1:8 for 5/99; 1:16 for NZ98/254. b LLOQ = 1:16 for H44/76; 1:8 for 5/99; 1:16 for NZ98/254. Wang X, et al. Vaccine. 2011; 29:4739-4744. Hosking J, et al. Clin Vaccine Immunol. 2007;14:1393-1399. BEXSERO is supplied as a 0.5-mL suspension in a glass prefilled syringe. The tip caps of the prefilled syringes contain natural rubber latex; the plungers are not made with natural rubber latex. Store refrigerated, at 36°F to 46°F (2°C to 8°C). Provide the Vaccine Information Statement. These are available free of charge at the Centers for Disease Control and Prevention (CDC) website (http://www.cdc.gov/vaccines). Register women who receive BEXSERO while pregnant in the pregnancy registry by calling 1-877-413-4759 [ see Use in Specific Populations (8.1)]. BEXSERO and MENVEO are trademarks owned by or licensed to the GSK group of companies.